Poetry is a fascinating use of language. With almost a million words at its command it is not surprising that these Isles have produced some of the most beautiful, moving and descriptive verse through the centuries. In this series we look at each calendar month through the eyes and minds of our most gifted poets to bring you a guide to the days within each. This volume of Poetry is all about January—the first month of the year in our Gregorian calendar ushers in the New Year and promises new beginnings. 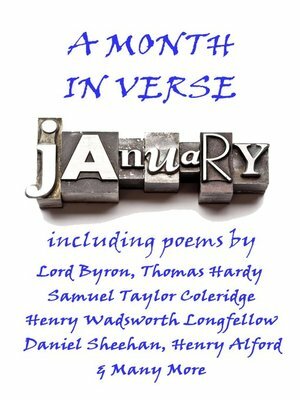 The cold and bleak landscape of this winter month provides a rich background for our esteemed poets including Lord Byron, Henry Alford, Thomas Hardy, Daniel Sheehan, Emily Dickinson and Christina Georgina Rossetti. They amongst many others offer us their reflections and counterpoints. Many of the poems are also available as an audiobook from our sister company Portable Poetry read for you by, amongst others, Richard Mitchley and Ghizela Rowe. The full volume can be purchased from iTunes, Amazon and other digital stores.